This video shows a brief walk through of one of our Trocari field sites near Sungai Besar, North Selangor, Malaysia. This site was once part of the Raja Musa Forest Reserve, but was illegally deforested ~15 years ago. Since then, the site has been drained and burned a number of times for land clearance and conversion to an oil palm plantation around 3 years ago (2015). 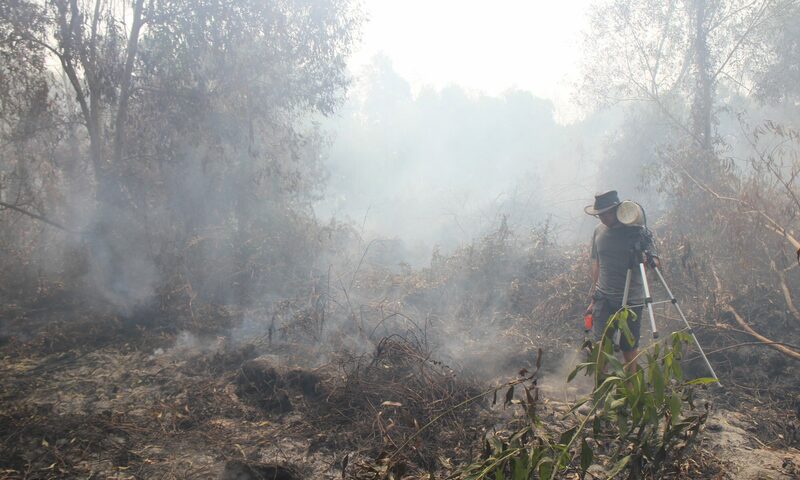 The video shows evidence of the burning, loss of ~1 m of peat soil profile, drainage, and the young oil palm trees. The converted side of the drainage canal is quite dramatically at a lower elevation than the forested side, with considerable loss of elevation due to peat fires, decomposition, and compaction. It also ends showing the rather precarious bridge onto the site. Quite tricky to negotiate when you’re carrying heavy and expensive scientific equipment.